M-F 7:30 a.m. – 5:00 p.m. Weekends -9:00 a.m. – 3:00 p.m.
Moving back to Lubbock from Colorado, Lindsay Kerr opened The Coffee Shop in 2016 with partners Cameron and Rachel West of the West Table Kitchen and Bar and The Brewery LBK, which are all located on the ground floor of the Pioneer Condos. As guests walk into the lobby of the historic building, they are greeted by plush decor and elegant white-marble floors. Just ahead and to the left, guests catch a glimpse into the modern, industrial space known as The Coffee Shop, complete with wood tables and geometric-tile flooring. As with the West Table, Lindsay uses high-quality ingredients and purchases the coffee beans from a few local from roasters like Gold Stripe and Daybreak. Having just purchased their own roaster, the shop plans to roast its own coffee in the future. For all the coffee connoisseurs out there, I have to confess I tend to order from the sweeter side of the espresso shot. I can’t seem to break away from my honey latte cravings. For anyone who shares a sweet tooth, instead of vanilla or hazelnut, try adding a little local, raw honey; it’s more subtle than a syrup, allowing the flavor of the beans to be enjoyed. Bonus: local honey helps with allergies, or so I’m told. While coffee is king, the shop offers loose leaf tea for those who choose to forgo the traditional caffeine fix. With a few tea options on hand, the season determines the offerings for the day. For these cold, West Texas mornings, the Warming Crimson Berry lives up to its name. The deep red, berry-forward brew will warm you from the inside out. If your stomach is growling, it’s most likely because homemade croissants and scones are warming in the oven. Baked fresh daily, the scrumptious flaky croissants are the perfect compliment to any cup of joe. Again, my sweet tooth comes into play with the chocolate chip scones. Tip: get there early, and you’ll catch a fresh batch as Lindsay pulls them right out of the oven. It’s worth it; not to mention, it’s the perfect excuse to indulge in dessert for breakfast! The shop also makes a white chocolate cranberry scone, and plans on expanding its pastry selection in the coming year. 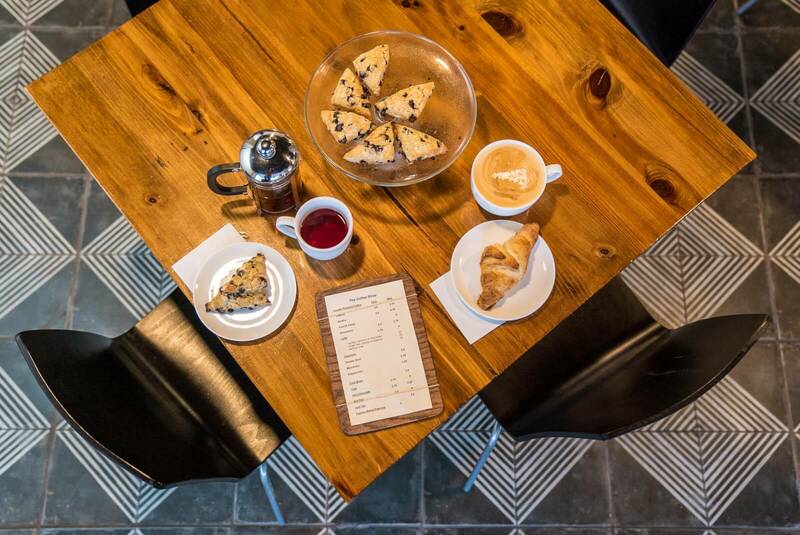 Aside from being a great place to grab a cup of coffee or a scone, The Coffee Shop also serves as the perfect space to host a morning staff meeting or a party. For those of you who frequent The Coffee Shop, as I do, post your favorite caffeine fix and/or bakery item on social and share it with us using #livelovelubbock. Don’t forget to stop by The Coffee Shop from 7:30 a.m. – 5 p.m. during the week or from 9 a.m. – 3 p.m. on the weekends.